A council has apologised for not telling villagers "in a timely manner" about the need to cut trees to make way for a school affected by HS2. Permission was recently granted to move Water Orton Primary School to land off Plank Lane to make way for the planned high speed rail route. 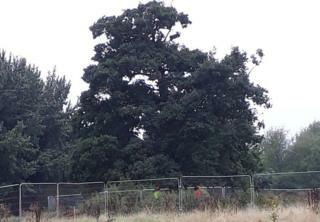 However residents saw two trees being cut down at the site before hearing about permission for the school's move. Resident Neil Bevan said there had been "no communication". Planning permission to move the school was announced on Tuesday but the oak trees were cut down on Monday. Felling trees was "an integral part of the plan" to build the new school, Warwickshire County Council said. Image caption Neil Bevan said the trees were at "the view looking from Water Orton towards the M42 area"
A spokesperson said: "It is regrettable that local residents were not informed in a timely manner about the need to fell the trees and we apologise for this. "We trust this will not overshadow the excellent news for Water Orton, that it is to have the essential new build school." Mr Bevan said a lack of communication was "disgraceful". He said: "They've (trees have) been there for years, a couple (of them) for 100 years or so." Commenting in the Water Orton Village Facebook group, Niki Dring said people had "had no chance to save these oak trees with nothing wrong with them". But Victor Carnaby said on Facebook: "A brand new school for the children of our village! Any idea how lucky you are to have this!"